It’s widely accepted that World War Two offered women temporary opportunities to step into male-dominated roles. In the case of New Zealand, they may have joined the newly established auxiliary forces, or taken on civilian roles made vacant when men enlisted. When I found that the war-time New Zealand Air Force magazine Contact – a great source of cartoons and comics – had launched a women’s section in 1941 (named Compact, no less) I was excited to see what it might contain. It seemed like a great opportunity to recover some forgotten stories and to find a new group of female artists to fangirl over. Spoiler: I was about to be disappointed. Contact magazine, Jan-Feb 1943. Comic by “Blossom” / Maurice Conly. Contact published dozens of artists during its two runs (1941-45; 1950-56) and was a welcoming space for artists to share their work. Cartoons, comics, and illustrations of various styles appeared from the first issue until the last and the artists came from all walks of (Air Force) life. Often, cartoons from a particular artist would appear in successive issues while they were on base, then stop when they were deployed. The Air Force had an official artist, Maurice Conly, who provided comics under various pen names, as well as illustrations, advertisements, portraits and cover paintings. However, having an official artist on the staff did not stop other recruits from sharing their work. Contact also appears to have been a relatively safe space for women. The formation of the Women’s Auxiliary Air Force (WAAF) in 1941 received some opposition, but Contact was quick to come out in support of women’s participation, with editorials, magazine covers, cartoons and a countdown (“It won’t be long, boys!”) all heralding their arrival on base. The coverage was sexist, for sure, but women were welcomed and appreciated so long as they played along. Compact launched in December 1941, six months after Contact. It was a space for women by women, occupying about 4-6 pages in each issue of Contact. The opening editorial stated “‘Compact’ is yours; the unofficial organ of the New Zealand Waafs. We need something; something to show that we are not merely a nebulous body of Service folk, but alive and interesting …” (p.19). Compact gave women a chance to reflect on life on base, to poke fun, and to support each other. The first article published in Compact lists the professional history and expertise of a number of WAAFs, designed, surely, to show the skills and experience they brought to the Air Force. Like the rest of Contact, Compact offered a mix of comics, illustration, poetry, and prose. 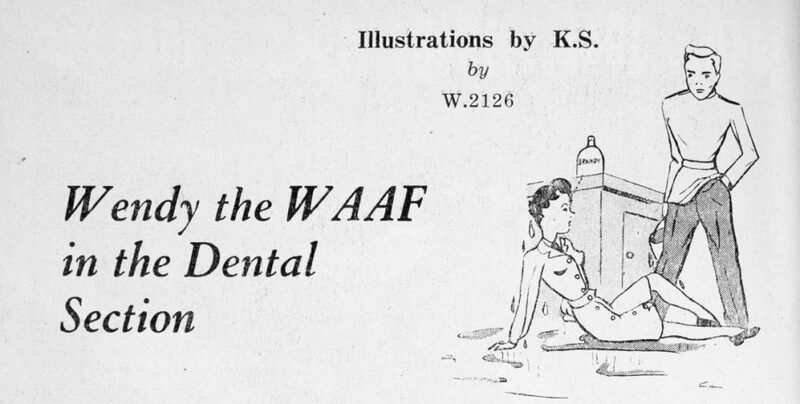 “Wendy the WAAF,” a series of stories written by Doris Mclean, was the most popular and enduring feature. Mclean also wrote a more serious column under her own name, but Wendy’s misadventures on base hit a chord with readers. (This article goes into more detail about Contact and the Wendy stories.) Wendy took on a new role in each story, unable to stay longer because something would always go wrong. She was in the Transport Section until she failed her driving test and was asked to leave the Medical team for smoking indoors. Contact magazine, Jan-Feb 1943. Illustrations by Peggy Sewell. At least one female artist’s work appeared in Compact. 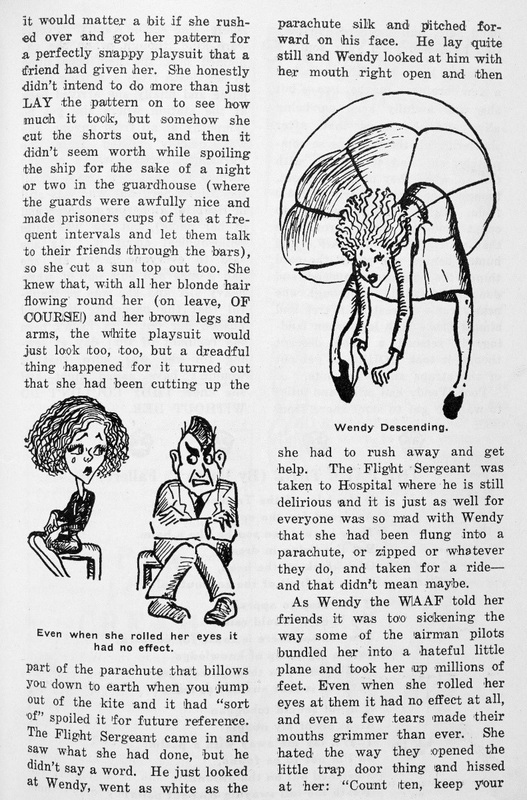 Peggy Sewell illustrated several of the Wendy the WAAF stories and someone using the pen name “KS” illustrated another Wendy episode. 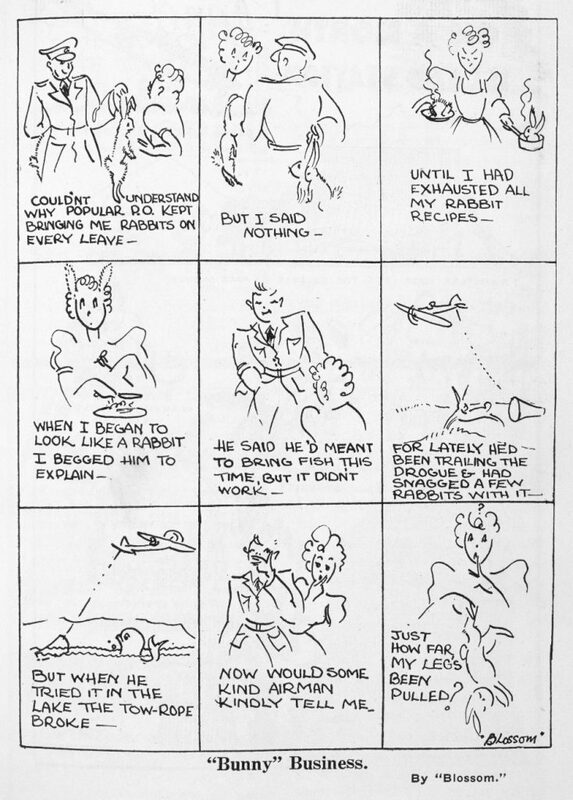 June Gummer did not draw for Compact, but did create cartoons about her experience as a WAAF and spitfire pilot (Bee Dawson, Spreading their wings, 2004). All three artists are fantastic, funny, and stylistically interesting. I’m particularly taken with the wry comedy of Sewell’s Wendy. These women may have continued to draw in some capacity after the war, but I can find no evidence of them having careers as illustrators or cartoonists. Contact magazine, October 1944. Illustrations by KS. Despite the talent for both humour and illustration evident within the WAAFs, it was Maurice Conly (the Air Force artist) who provided the only comic to run in Compact. He used a pen name – “Blossom” – and drew from a female point-of-view. I spent weeks looking through WAAF histories and staff lists to try to identify Blossom before reading Conly’s biography and realising it was him. Conly was a versatile artist, and as the official Air Force artist, it was his job to provide imagery for use on base (and in Contact). This does little to take the sting out of the disappointment I felt when I realised he was Blossom. ‘Blossom’ drew fourteen comics, published between 1942 and 1945. I don’t know how these comics were received. Unlike Wendy the WAAF, whose enthusiastic audience wrote in to the magazine demanding they reveal her creator’s identity, I have found no responses to the Blossom comics, although Conly refers to them as ‘a long-term favourite’ in his memoir (Portrait of an Air Force, 1987). Certainly, their humour is recognisable to a present-day audience, although I don’t often find myself laughing along. Gender – and the incongruity of having women on base – are the dominant themes of the comics. Like Wendy, this is generally at Blossom’s expense: she is confused by military speak in the first comic and often has her romantic hopes dashed. Unlike Wendy, Blossom doesn’t appear in uniform, although the situations she appears in and the timing of the comics suggests that she was a WAAF. Contact magazine, May 1943. Comic by “Blossom” / Maurice Conly. 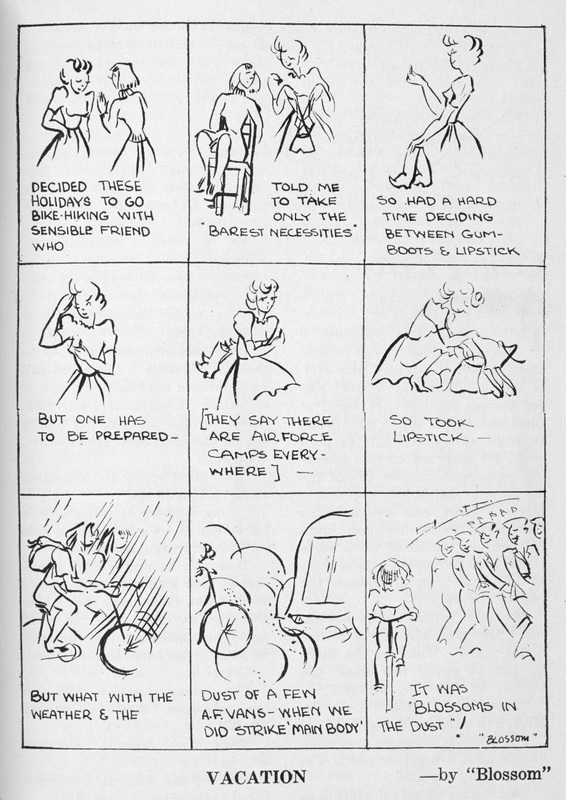 These comics undermine the important role that women were playing as part of the WAAF. Their work on base is trivialised and at the same time an opportunity for female artists is being taken away. I don’t want to demonise Conly here: he had the skills to do the work that he was asked to do and he championed the WAAFs in other ways (he painted two WAAFs in uniform for covers of Contact, for instance). The Wendy stories also suggest that he was tapping into an established thread of humour, one used by women as well as men to make sense of their wartime experiences. The post-war period was an interesting one for New Zealand comics, with 1950’s policy makers and agitators making links between juvenile delinquency and comics, leading to widespread censorship and a decline in the industry. Blossom was not affected by this. She was demobilised alongside most other WAAFs at the end of the War, although Conly would continue to draw for Contact until it ceased publication in the 1950’s. As soon as Blossom was gone, he created another character and strip, ‘Simon’, and added a new feature to Contact: its first pin up girl.